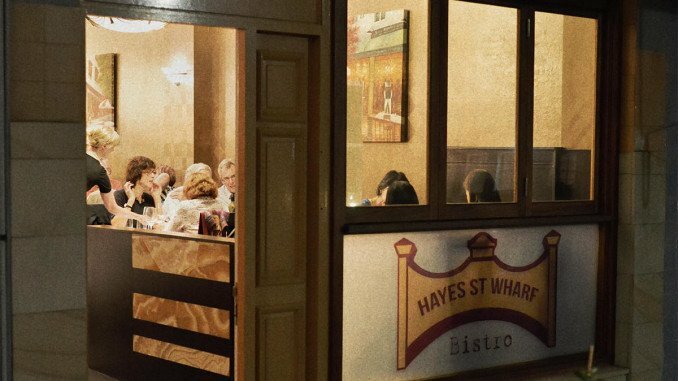 The Hayes Street Wharf Bistro in Neutral Bay describes themselves thus “It is our aim is to be a favourite neighbourhood bistro serving modern French cuisine” and they do a great job of it. It’s a friendly, good quality French bistro in the heart of Neutral Bay. Away from the hustle and bustle of Military Road the Hayes Street Wharf Bistro is located half way down Hayes Street, on the way to ferry wharf. Gavin and Natasha Tuckwell took over “Restaurant Thirteen” and relaunched it as The Hayes Street Wharf Bistro in February 2013. Gavin is head chef and learned his craft under the tutelage of Serge Dansereau of Balmoral Bathers Pavilion and is late of La Grillade in North Sydney. Gavin’s cuisine is much more accessible than the complex dishes of Balmoral Bathers Pavilion, delivering modern French cuisine without the heavy price tag. The restaurant is cosy and friendly with the metallic brown walls exuding a warmth and detail that is carried through to the food. This evening we were a party of six people and there were two other tables of six and a table of eight in the restaurant, along with a smattering of couples. The numbers of people were no issue to the kitchen and our meals came out in a timely fashion, with care and precision. The menu is small but varied with elements to suit most tastes. I elected to have the set price meal of three courses for $60.00 and dived in to a substantial and delightful meal. 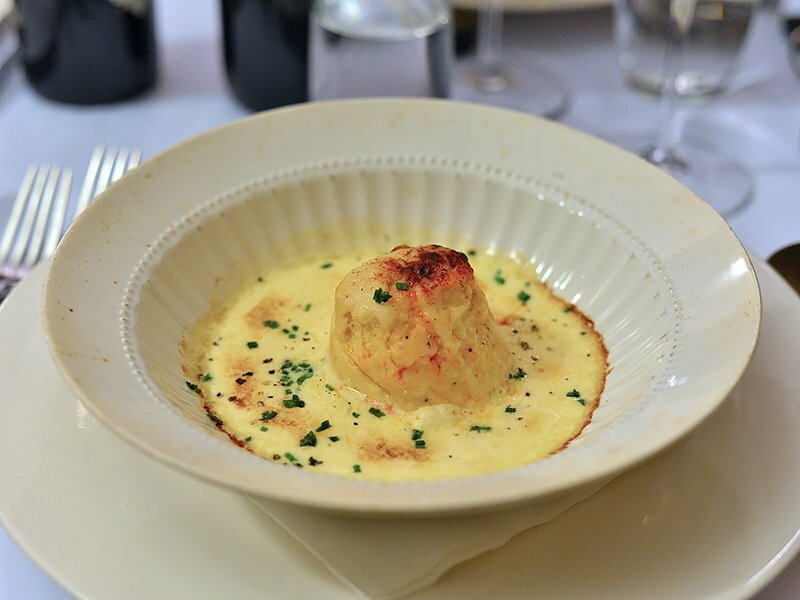 The twice baked Gruyere cheese soufflé was light and served with suitably strong Gruyere cheese sauce. Delivered in a bowl that had clearly come straight from the oven it was piping hot and a delight to eat. The soufflé was light and golden and the Gruyere cheese strong and luxurious. A Boudin is a sausage and this strange little sausage of scallop and carb is served in tomato and seafood bisque. This is their star appetiser, with a little sprinkle of black caviar on top. The crab brings a beautiful seafood taste while the scallop adds a delicacy and sweetness which is offset by the peppery tang of bisque. 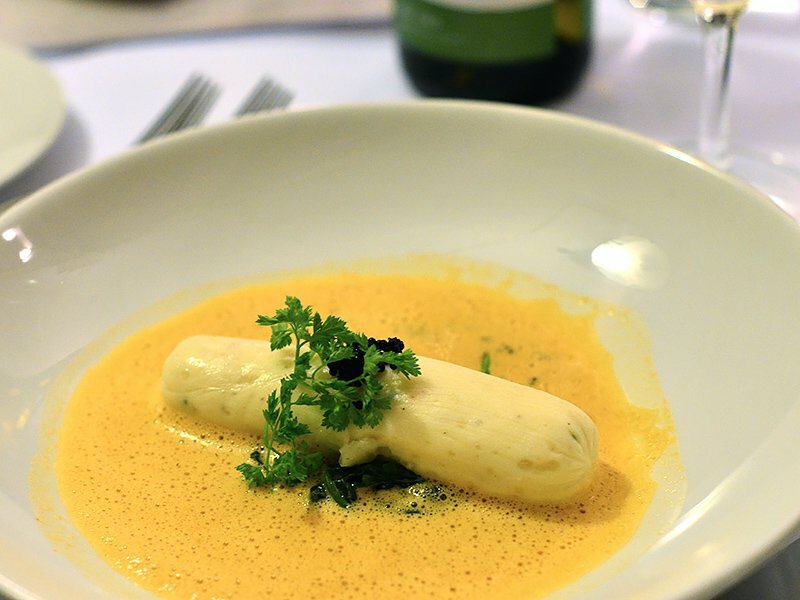 The boudin blanc makes a perfect starter, perticularly if you are looking for something light and delicate on the palette. 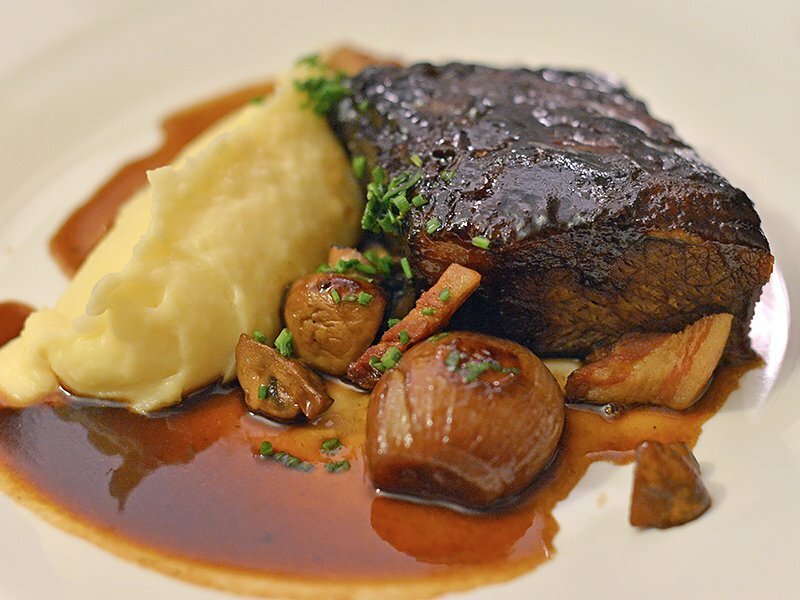 A beef bourguignon is usually a slow cooked stew, a dish that emanated from Burgundy in the east of France. Gavin’s interpretation is to take a really good piece of beef brisket and slow cook it, and then serve it in good gravy with truffled mash and shallots. The beef was falling-apart tender and the sauce was reminiscent of old-fashioned French sauces “big” and beautiful. There were lardons of bacon roasted in to the sauce which developed the overall flavour of the dish. I am always a little cautious of French fish dishes simply because the sauce can over power the delicacy of a good piece of fish. No such issue here with the veloute, or velvet sauce of saffron and fish stock well balanced and in sufficient quantity to compliment but not overpower a really good piece of John Dory which had been cooked to perfection. Ah, a chocolate desert. 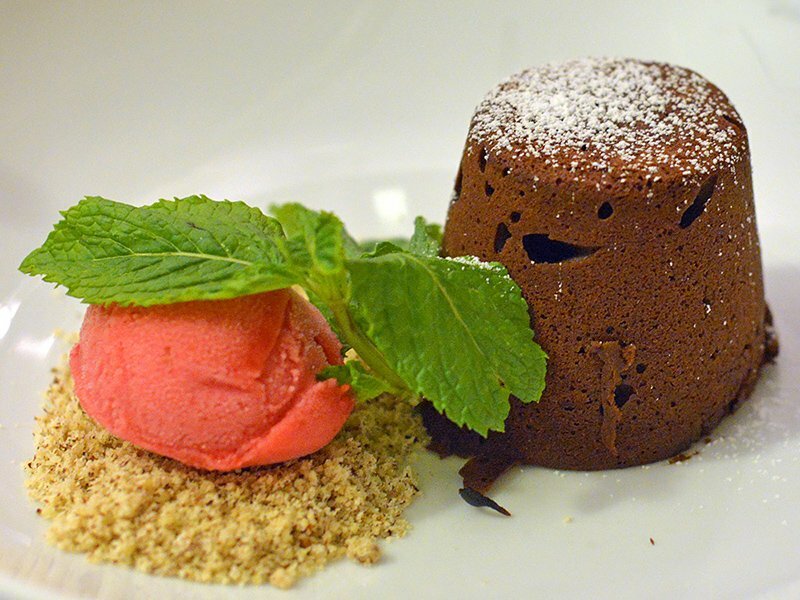 It’s worth heading to Hayes Street Wharf Bistro simply for the desert. The chocolate fondant was oozy and sweet. Freshly baked it came as a little tower of chocolate cake and served with a tart raspberry sorbet on a bed of ground almonds. Very, very nice. The chocolate was sweet but had a good chocolate flavour and the sorbet cut through to balance the dish. The Hayes Street Wharf Bistro offer dishes that are well crafted, modern a tasty. Their dishes harken back to traditional haute cuisine of France, without the needless complexity and without the heavy price tag. This place is exactly as it describes itself; A neighbourhood bistro, serving modern French cuisine. And they are doing it very well.